1. Align the upper and lower laser heads of the laser die cutter, adjust the laser power to 12, then affix the transparent adhesive tape to the laser head reflector and point the light to see if the light beam hits the center of the reflector, if not by adjusting the laser tube. About the height, let it be centered. 2. Adjust the laser power of the laser die cutter to 9 with a transparent tape attached to the nozzle of the laser head, and point out the light to see if the beam hits the middle of the nozzle, if not in the middle by adjusting the three copper screws on the mirror. 3. Adjust the laser power of the laser die cutter to 40. Take the 18mm acrylic sheet on the nozzle of the laser head. Point the beam to see if the beam is straight on the board. If it is not straight, adjust the height of the laser tube to make it straight. 4. Adjust the upper and lower lasers of the laser die cutter’s laser head, the next laser head does not move, just adjust the laser head up and down, left and right directions, so that they can be fully aligned. The dimming of the laser die cutting machine and the points that need attention in the use process have been described in detail above. The laser die cutting machine has more dimming details, and I hope you will pay more attention to it during the usual use of the laser die cutting machine. 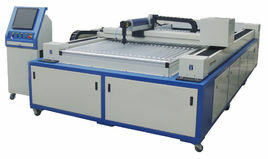 < What do you need to pay attention to buy a laser die board cutting machine?